Winter mostly requires heartwarming soups, stews or chilis, but sometimes we feel tired of all these and crave for something lighter and simpler, right? This Simple Spicy Fried Cauliflower will make a good change in your menu. Make it when you want to go simple on a winter day as a main dish and serve with yogurt. This makes a quick side dish too, so you must still try it even if you’re not bored of having warming dishes. This spicy fried cauliflower florets will change the feelings of any cauliflower hater! It is so tasty that you can even get addicted! 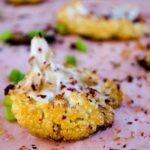 While roasted cauliflower with sumac is my favorite, I’m never tired of trying new recipes with this so-called boring vegetable. We always need variety, don’t we? If someone says that cauliflower tastes no good, believe me he doesn’t know the right way to cook it. It can completely transfrom into an amazing food when cooked right and this spicy fried cauliflower recipe is one of the best right ways to enjoy cauliflower! Cauliflower florets are dipped into a spicy mixture right before going into a very hot frying pan and they become irresistibly appetizing. You can skip the dipping mixture and toss them directly into the pan if you want it even simpler, they are still good but I highly recommend you to give that mixture a try to see how it changes the taste of cauliflower. So what does the dipping mixture contain? An egg, some milk and corn flour are mixed together until smooth. Then it is spiced up with a little cumin, black pepper and ground coriander seeds. You can use all purpose flour as well, but I wanted it to be gluten-free and have that golden look. Fried cauliflower is mostly preferred warm, so you can serve them warm with some homemade yogurt alongside. I love them eating cold though. I find them are even better the next day. Fried cauliflower becomes an amazing when dipped into a spicy gluten-free batter before they are fried. Toss in the spices and stir. Set it aside. Dip cauliflower florets into the spicy batter and place them carefully in the hot oil. Fry them a few minutes flipping over occasionally. Transfer them on a paper towel to remove excessive oil. Serve warm or cold with yogurt. Hi Mev! Thank you for this comment. I wouldn’t be aware of that error otherwise. I’ve just fixed the recipe. Hope you love it as much as we do!